Dragon Models Limited released its first big kit of the SCUD B in 1992 but for more than 20 years it was the only one out there. In 2014 both Meng and Trumpeter announced new SCUD B kits (Trumpeter was first on the street) and in 2015 Trumpeter followed that kit with the 2P19 tracked version on an IS/T-10 chassis. But both kits were missing a number of details as well as coming with only a training warhead coupled to the missile. At the end of 2015 Trumpeter announced a kit for the crew of the SCUD B (seven figures) which seemed expensive, but when the kit showed up it actually including not only the crew as promised but upgrade/detailing sets for the SCUD B missile itself and also for the MAZ-543 launcher vehicle. This alone makes the kit a worthwhile investment. 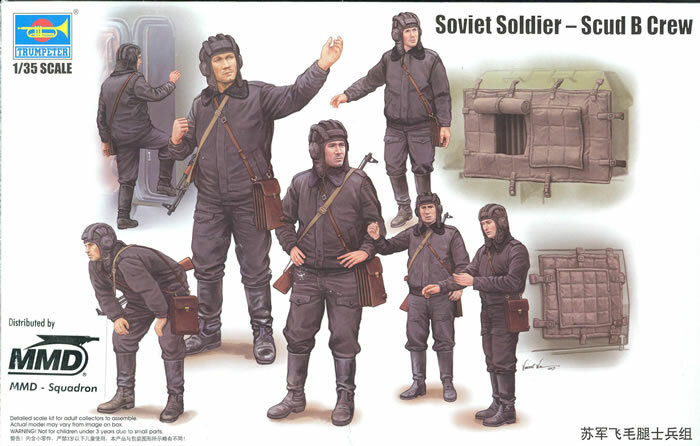 The kit provides seven figures and six AK rifles (four regular, two folding stock) and a number of other items. These items are primarily designed for the missile and the 9P117M1 launcher but the missile items will all fit perfectly on the missile with the 2P19 as well. Among the items included are a fret of etched brass that provides a wealth of small details not found in either original kit. These include access panels for the missile airframe and details for the rear of the launcher to include MAZ taillight shrouds (F25, F26 with two PE-6/PE-9) and a shroud for the erection control box (H226 with PE-12). They also provide the clamps which hold the cables in groups of two or three with both their fittings (PE-14) and the clamps themselves (PE-11, PE-5). These are designed to fit on bus fittings for the cables (W4) with small pips to cement the cables to them (W1). While this is well and good, Trumpeter does NOT show you where they mount or where the cables attach to the missile! There are diagrams available on the Internet and Facebook so some searching is in order to find out how to attach them. The set also includes two new warheads. The kit comes with an 8K14UT warhead which is a ballasted weight dummy for practice, so now the new kit offers the early 9N33 warhead or the more common 8K14 warhead. To be precise, neither one is actually a warhead but a bus vehicle to carry a specific physics package providing a specific nuclear yield. The 9N33 was the first warhead and had packages for 5, 10 or 30 kilotons; the 8K14 was used with a variety of yields and two generations of physics packages that included 10, 100, 200, 300 and 500 kiloton yields. There were dummy 8K14 warheads used for training so you can fit the 8K14 one (W5/W6) to the missile; different numbers and colors of stripes were used to differentiate simulated yields with one or two white bands and one red band being noted in training sessions. The tip was usually white or light tan (the leading cone section). The kit also includes soft vinyl parts for the winterization kit for the MAZ-543 vehicle but only shows a thumbnail sketch of where they go on the box top. These consist of the grill mask (Z H1) with open (Z H1/H5) or closed (Z H3/H4) panels. Parts Z J1, J2, and J3 are for the grill on the battery box section of the bins behind the driver’s cab and serve the same functions. I think parts Z J4-J7 are for the door windows in the launch and status cabins amidships with Z J4 and Z J7 being open and Z J5 and Z J6 being down and closed. Two small decal sheets are included to provide a single black stripe for the warhead and also all of the lifting and handling markings for those warheads. Overall this is a great set to complete your SCUD launcher and if you have an Ural-4320 you could convert with a crane into a 9T31, you could show the launcher with one of the more common (and hated) drills - changing out warheads! The ICM Zil-131 is also a perfect choice for a command vehicle. But while this is a great kit the lack of proper directions and diagrams either forces the model to ignore its best parts or search for far more detailed information elsewhere.